Life is full of challenges and it's certainly not fair and some people seem to face pretty big hurdles right from the start. Mark Goffeney was born to a musical family, but without the benefit of arms. Mark didn't let this simple impediment keep him from pursuing his passion for playing and eventually learned how to play guitar on an instrument his dad brought home from a garbage dump. 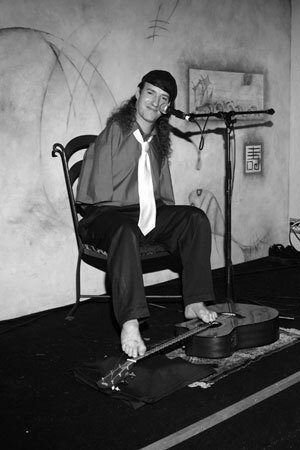 Goffeney started his career playing in Balboa Park, San Diego, under the name "Big Toe Band," but has more recently also performed on national television and on a couple commercials. He falls in that category of one of those guys I would hope to meet someday. He's very good!! I will look for him next time I am down there to visit. Whenever I think my obstacles are great, I am always reminded of our great good fortune.